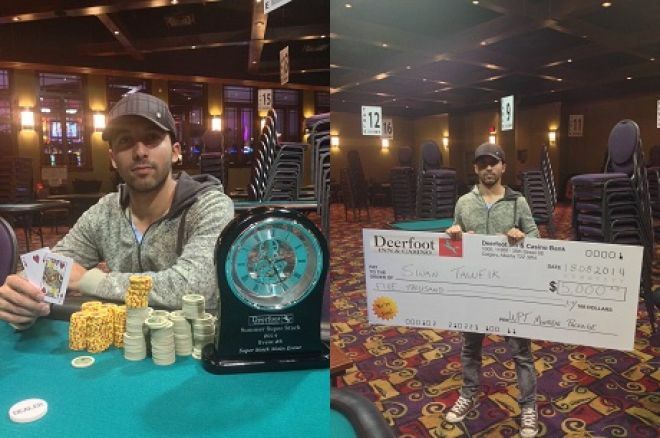 The $1,500 Deerfoot Inn & Casino Summer Super Stack Main Event wrapped up in the early hours of Monday morning in Calgary, Alberta, with Sinan Tawfik being crowned its victor after close to 13 hours of Day 2 play. Tawfik may have outlasted the 150-player field in the $200,000-guaranteed no-limit hold’em tournament, but he definitely had his work cut out for him during final table play, even falling to the short stack early on. The main issue was that 'Joe T', a fierce high stakes pot-limit Omaha player, had acquired almost half the chips in play just as the money bubble of 15 players broke. While players tiptoed around Joe T, Tawfik started to gain some ground, chipping away at the cautious stacks until, finally, he found himself around even with the chip leader as three-handed play began. The shortest stack, while still relatively deep in terms of the blinds, belonged to Umang Dattani, (also known to many as Ronnie), and whose most notable previous cash was an impressive 36th in the World Series of Poker Main Event — experience that wasn't helping things finish off any easier in this event. These shenanigans and the table chatter continued between the pair until finally, Tawfik and Dattani clashed hard on the turn of a board of . All of the chips ended up in the middle with Dattani shoving to be snap-called by Tawfik’s , sending Dattani to the rail in third for $25,000. Meanwhile, at the final table of the $330 Last Chance event, Shawn Sperber was still in contention for the High Points Player of the Series award of a $5,000 WPT Montreal package. If Sperber were to win the event, but only a win would do, he would have more points than the eventual Main Event winner. This had been changing the dynamics of any deal talks, but when he did go out in fourth, after already having another impressive finish in second to Bo Fric during the $550 Mega Stack, the $5,000 was back in play for the Main Event winner. Joe T and Tawfik tried to make a deal and, on asking the rail, Fric suggested $44,000 to second instead of $36,500, while the winner would take the clock trophy and the WPT package, along with $49,500. Tawfik was willing to split the package, but would not give Joe T any more than $42,500. Despite a long day at the felt and both players looking forward to celebrating, Joe T, laughing, kept on about it being a “matter of principle,” even though the difference in prize money was the rough equivalent of a single hand they had been playing in the $50/$100 PLO games held over the series — the same reason Tawfik was willing to give up another $1,500 to Joe with a 2.5-to-1 chip advantage. Play dragged on, though the very equally matched players paid more attention to hashing out an arrangement then the cards they were dealt. It looked close at $43,000 to Joe T, but he laughingly raised it $43,500 and Tawfik jokingly jumped across the felt and pummelled him with a few fake blows. Fric mediated once again, asking $43,100 and finally suggesting Tawfik take care of the tip in both their names if Joe settled on $43,000. Joe T thought this was a very smart idea and Tawfik agreed, and then joked about getting the trophy, picking it up. Tawfik was ready to get back to playing and a jovial Joe T decided to quit being difficult. The deal was sealed and Tawfik, with no less than six other Alberta first- and second-place finishes on his poker resume, added Summer Super Stack Champion!